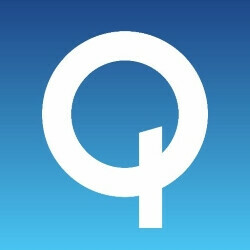 UPDATE: This article was updated on Jul 07, 05:33 CDT to reflect relevant information supplied by Qualcomm. Apple and Qualcomm are at it again, with the latter now demanding US imports of iPhone models containing "key" Qualcomm technology be banned, unless Apple complies. This applies to all iPhone models using cellular baseband processors other than those supplied by Qualcomm’s affiliates. Moreover, big Q wants to stop further sales of all infringing Apple products on US territory, and halt all of the company's operations related to warehousing, marketing, advertising, and showcasing the iPhone. Qualcomm accuses Apple of infringing on six Qualcomm technological patents, essential to "important features and functions in iPhones", that extend beyond modems and cellular connectivity. They mostly have to do with conserving battery life during regular cellular activity or high performance load. Apple's use of these technologies is considered "unlawful and unfair." Thus, Qualcomm is going in guns blazing. It's one huge company with an almost monopolistic presence against the other, which happens to sell one of the most popular – if not the most popular – smartphones in America. It is interesting how Apple will respond to Qualcomm's demands this time. In April, the Cupertino company sued the chip maker on claims of patent licensing fees extortion – allegedly, up to five times more than all of its cellular patent licencors combined! Apple's stance is that Qualcomm is merely one of "over a dozen companies who contributed to basic cellular standards." While Qualcomm appears bullish in its demands, it is not exploiting the law and it must defend its intellectual property by every legal means possible. Apple is knowingly using these six patents, all issued in the last four years, without making the required payments - all while entangled in the legal dispute with Qualcomm. 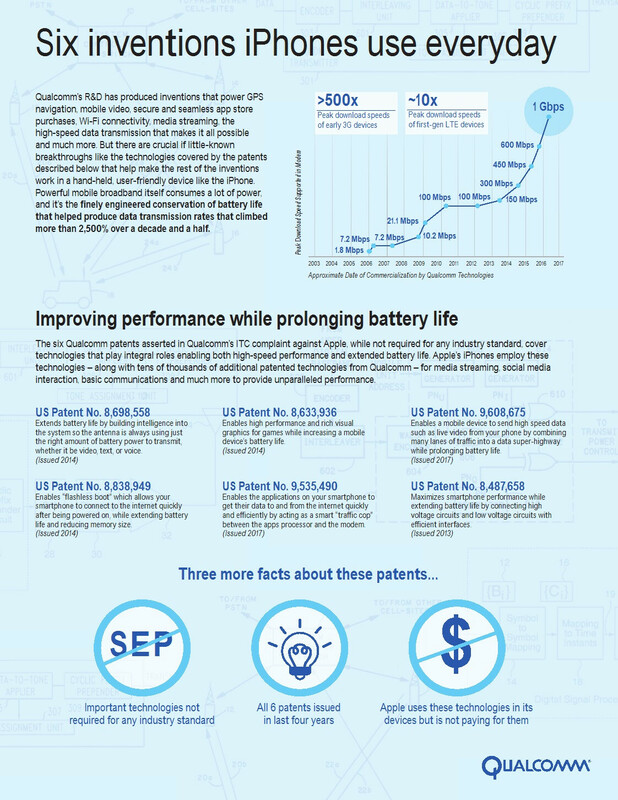 For those interested in the patents' content, Qualcomm supplied the following infographic to outline their essence and contribution to the iPhone's functioning. Jun 22, 2017, 9:56 AM, by Simon K.
Jun 20, 2017, 8:28 AM, by Damian M.
May 25, 2017, 10:06 AM, by Simon K.
Won’t happen. Qualcomm trying to create bargaining chips for later use. Remember it’s not just Apple who are in a legal battle with them, Qualcomm have been overcharging everyone. Definitely. Either way, it would never happen even in Qualcomm’s wildest dreams. The iPhone is the number one single selling smartphone model. The US would never allow such insane amounts of money disappear because of QQualcomms salt. Overcharging everyone? They should be able to charge whatever they want for their property. You got to be kidding. Apple is the king of overpriced hardware. Just look at their latest iPhone 7. A low resolution (1334x750) HD display, 32 GB of non expandable storage, 2 GB of RAM, cat 9 LTE, no wireless or fast charging, a slow USB 2.0 speed lightning port. If the iPhone 7 was an Android smartphone, then it wouldn't get more than $250 for a brand new smartphone. Hey dumb head, Apple makes an entire product out of small hardware parts they buy from hundreds of companies like Qualcomm. That's why they have the right to decide their pricing. And Qualcomm doesn't have that right? No. They simply don't have the right because they are under long term agreements with OEMs. Apple is not under any legally binding obligation like that with consumers to sell their products for fixed rates. Hardware component business and electronic device business have completely different sales strategies, ethics and regulations. If Qualcomm is in a long term binding partnership agreement with Apple they simply cannot increase loyalty fees or component prices for their liking for their convenience. That's a complete violation of the agreement. If they want to do that they will have to terminate the original agreement and come to a new revised agreement. "That's why they have the right to decide their pricing." And Qualcomm also has the right to decide on the price of it's products. If Apple doesn't want to pay the price Qualcomm d of it's chips, then Apple should simply note buy it. But you don't agree to pay and then complain later. Another unreasonable comment just to defend apple. You're such a blind fanboy. If Apple can charge higher price for their low specs phone why not Qualcomm that's business. And for that price apple is charging to us who wants their product. It is imperative that the cost for licensing those rights are included and they should pay also to those who own the property rights. You're not being reasonable on your comment. It must be very frustrating for you fans when a device that you think is as bad as you say it is, beats the cap out of your preferred device in every day usage and in sales. A phone that no one HAS to buy unless they want to. There are plenty of other options for a smartphone if a person thinks Apple is too high. Everyone wants to quote just what the parts that make up the phone cost, and not take into account paying the workers that assemble them, and shipping costs, import costs, etc. A lot more goes into the price of these phones than just what the parts cost. But again, if a person thinks its too expensive, they don't have to buy it. Ppl on here whine way too much when they don't even plan to buy the product. If you actually spend the money on it, then you have a legit argument to whine about it. Using that logic, it would be the same as a drug company that has all of the patents related to drugs for a disease like multiple sclerosis or lung cancer and you were to say "oh yeah they can totally charge $10,000 a pill for their products". The reality is Qualcomm isn't operating in a competitive environment when it comes to their mobile modems. And Qualcomm makes their customers sign an agreement that basically says if you want our chipsets you can't buy from these other manufacturers or else you'll pay us a fine. And since Qualcomm makes certain modems because of their patented tech that NO other company can, its all become a giant monopoly. Yeah except....you know Qualcomm charges Apple something like $30 on a $800 product. Who's doing the gouging here? You do realize that Qualcomm makes like over $20 billion a year in revenue, right? And you also do realize that the argument here is not over Apple paying Qualcomm the money for their chipsets, it's over the fact that Qualcomm demanded the same royalty payments for iPhones that DID NOT have Qualcomm chipsets in them. Qualcomm was wanting Apple to pay for iPhones that were sold with Intel chipsets because they assumed that Intel chipsets use Qualcomm technology and therefore they deserve royalties on it. Never mind the fact that if this were true then not only would Qualcomm be getting money on every iPhone sold regardless of whether a Qualcomm chipset was used, but they would also be getting money separately from Intel for making said chipsets with their licensed technology. That's what we like to call in the business world: double dipping. Remember: Blackberry brought a similar suit against Qualcomm and won almost $1 billion in court. And also remember that Qualcomm is the reason why Exynos processors aren't used in the US except in smaller quantities. It's anticompetitive and I think anyone that is for a monopolistic Qualcomm is really cheating us out of having choice and better technology. Well, that really makes a lot of sense now. Mind sharing your sources? I didn't get that perspective from this article. Certainly. Let's first visit the source page for this article. Qualcomm's OWN PRESS RELEASE STATES: "The Company is seeking the LEO against iPhones that use cellular baseband processors other than those supplied by Qualcomm’s affiliates. " In other words, Qualcomm is not asking for a ban on ALL iPhones coming into the US but instead ALL INTEL modem iPhones. So, PA has actually got it very wrong here. ZDNet confirms this in an article they wrote today as well. https://www.digitaltrends.com/business/apple-vs-qualcomm-news/ This article talks about the "double dipping" I mentioned earlier and also the precedent that Apple has for suing Qualcomm. "The iPhone maker pointed to a U.S. Supreme Court ruling in May that limited the ability of patent owners to control the use of their products after they’re sold. Qualcomm, Apple said, is illegally double dipping by selling the chips it makes and also licensing its technology." Also, it is important to note that according to this source even though Qualcomm is NOT RECEIVING PAYMENTS, it has decided to CONTINUE TO SELL Apple it's chipsets. "But the CEO said Qualcomm will keep supplying chips to the Cupertino company, even while the legal battle rages on." And on top of all of that, the U.S. FTC and the Korean Fair Trade Commission both found that Qualcomm was guilty of monopolistic/anticompetitive tactics and the Koreans actually fined Qualcomm $854 million. This comes around the same time that Blackberry was awarded almost $1 billion for being overcharged for royalties over several years as well. And don't forget that in 2015, China found that Qualcomm violated it's antimonopoly laws and fined the company $975 million. Samsung and Intel have both filed briefs defending Apple's claims that Qualcomm has acted in an anticompetitive/monopolistic nature as well. The European Union is investigating Qualcomm for multiple antitrust activities. I understand people want to turn this into an "Apple fanboy vs the other brands fanboy" war, but the reality is those defending Qualcomm have no real leg to stand on. You have multiple companies that have been affected by Qualcomm's royalty claims and multiple government agencies that have already found Qualcomm to be practicing in a monopolistic fashion. The facts are there. Unless someone can point to some big government conspiracy similar to when Klinton claimed the Note 7 was sabotaged by the U.S. government...I would love to hear the theories on this one. Except it's not like that. Your "logic" is off, sport. It's like a drug company letting others make their drugs but for 2% of whatever they sell them for. Everyone else has gone about fighting Qualcomm pricing, the right (aka legal) way, but apple has instructed its suppliers to not even bother paying Qualcomm royalties. God forbid apple has to pay what everyone else pays for licensing, right? Imagine someone doing that to Apple. They have paid Qualcomm royalties. They are withholding the royalties for Apple phones that contained Intel chipsets. That's the legal argument here. Can Qualcomm charge a royalty for an Intel chipset? EDIT: I should correct what I intended to say. Yes they technically suspended paying royalties to Qualcomm, but their goal is to pay the royalties for actual Qualcomm chipsets instead of having to also pay them for Intel ones too. Dude, you're wasting your time. As soon as these dudes saw "Qualcomm vs. Apple" it became a sporting event to them. I guarantee 75% of the commenters here didn't read one sentence of the actual article, let alone research any information into the suit. "Can Qualcomm charge a royalty for an Intel chipset?" Yes. Because Apple, like all other OEM, agreed to it when making the deal with the supplier. How do you know they agreed to that? Do you have access to their licensing/patent deal? That's the reason this is a legal dispute, because Apple is alleging that it is exactly NOT what they signed up for. Otherwise, there would be no legal precedent to go forward with. Isn't that basically what Apple does? They make suppliers sign agreements to not sell tech to their competitors or at the same extremely low price and must give Apple preference. There is no real way of knowing if they still do it, but there was the case of GTAT who supplied the sapphire glass to Apple and ended up suing Apple for something similar. And I would say that I have taken the side of those suppliers in those cases as well. Again, I am not sitting here trying to defend Apple as this worthy company because I know they do some shady business practices as well. And if there was a news article released today or a year from now that alleged Apple was being anticompetitive in their contracts with suppliers then I will ALWAYS take the side of the end consumer which means I am against anything monopolistic in nature. However, in this case, Qualcomm really has some bad business practices and they have a long history of it. How can they charge "whatever they want" even though it's their technology? If there is an agreement they should comply. And also they cannot change whatever they want because there are competitive prices in the market. Also they can't just increase the prices when ever they want. Apple should use them and destroy they. If they're overcharging everyone then by default they are charging their normal fee. As if Apple is not overpriced.... The thing is, it is about value. If it is considered too expensive, why not use other companies' technology? Because of VALUE! Because Qualcomm's tech is so valuable, and that there is high demand for it, they put a high price. It's capitalistic economy 101: you put a price that can generate maximum profit. Tell me how Qualcomm are overcharging Apple and Apple is not overcharging its customers. Did not Apple agree to pay Qualcomm a price just as iPhone users do when they buy their phones?